Skincare is a priority if one wants to defy ageing. Healthy and glowing skin, free from any dry patches, chaffing, discoloration and other skin affliction is testimony of how one is healthy from the inside. It’s essential to eat right, incorporate a lot of vegetables, fruits, nuts and legumes in a diet to achieve soft and smooth skin. At the same time, outside care is also crucial – particularly skin cleansers. While ordinary bar soaps are notorious for drying skin out, disrupting the natural PH balance, other skin cleansers promising thorough cleansing and nourishing skin at the same time contain dubious ingredients capable of doing more harm than good. Aqualis African Black Soap that was launched in Nigeria recently is one skin cleanser that is specially formulated to care for skin in all aspects that help skin to be rejuvenated and vibrant. Aqualis African Black Soap’s ingredients cover a whole lot of skin needs – for skin to look beautifully and irresistibly soft and smooth – to the touch too. 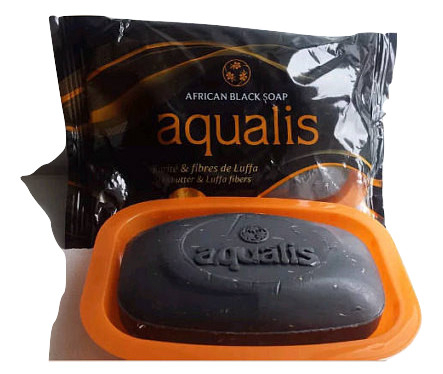 All ingredients in the soap are derived from nature so it’s guaranteed that Aqualis African Black Soap won’t incur any allergic reactions and is suitable for all skin types. It’s made in such a way that every ingredient that goes into it is proportioned to the detail for optimum skin benefit. The luffa fiber in Aqualis African Black Soap serves as an exfoliating agent – it removes dead skin cells, stimulate the skin and promote new skin cells growth. There is no need to use a separate exfoliating agent as Aqualis African Black Soap manufacturers have thought of it all. Also enriched with shea butter, Aqualis African Black Soap has the potential to treat a host of skin ailments like eczema and psoriasis along with having high moisturizing content and ability to treat blemishes, wrinkles, itching and even skin allergies and insect bites. Organic oats and aloe are formulated in Aqualis African Black Soap – oats gently cleanses the skin from impurities and absorbs any excess oil secretion from skin while nourishing while aloe soothes irritated and sensitive skin and lend much needed moisture for dryness. Vitamin E in Aqualis African Black Soap protects skin from free radicals and serves as an antioxidant, keeping skin youthful. Simply lather Aqualis African Black Soap on hands or a washcloth and cleanse the skin. All the natural ingredients combine to clean, nourish, exfoliate, moisturize and heal skin – it comes with a soap tray. 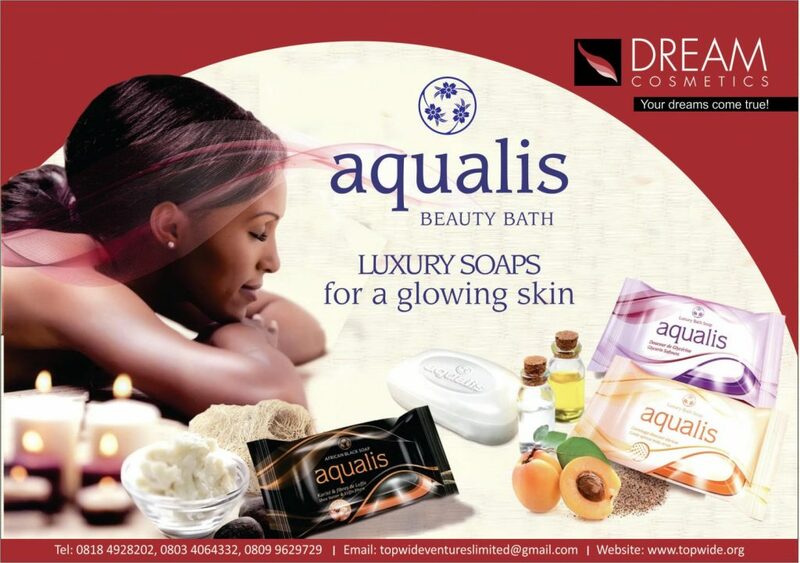 Aqualis African Black Soap is manufactured by DREAM COSMETICS and is distributed in Nigeria by TOPWIDE VENTURES LIMITED. Address: Plot 30, Babs Animashaun street off Bode Thomas Surulere,Lagos.